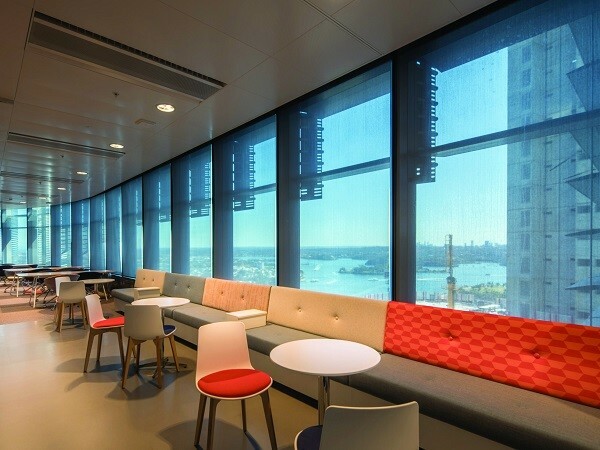 Hunter Douglas Architectural supplied its Screen Nature Ultimetal roller blinds for installation at the Barangaroo Project in Sydney, New South Wales. Screen Nature Ultimetal is a new and exclusive fabric for roller blinds from Hunter Douglas Architectural, featuring metallisation on one side to provide the perfect blend of thermal and visual comfort. Situated on a section of Sydney’s north-east foreshore, the Barangaroo Project is a $6 billion, 22ha precinct development scheduled for completion in 2020. The massive urban renewal project features mixed-use commercial and residential towers up to 32 storeys high, 11ha of newly accessible public spaces and an upgraded underground walkway to Wynyard station. Developer Lendlease commissioned Neil Krotzsch, director of Horiso Engineering Division, to design a shading and control system solution for the three ITS towers in Barangaroo South. The solar shading system was required to ensure the entry of direct sunlight into the floor spaces to maintain comfort levels, provide enough view through to showcase the harbourside location of the building, minimise solar glare, and maximise the building’s overall energy efficiency. Lendlease partnered with commercial specifier Turner Bros to put these specific requirements out to tender. Hunter Douglas Architectural responded with its newest and exclusive fabric for roller blinds, Screen Nature Ultimetal, and was selected as the supplier for Tower One and Tower Two. Screen Nature Ultimetal features an ultra-fine layer of aluminium on one side of the fabric to dramatically improve solar energy control. The fabric reflects 70 per cent of solar energy, translating into significant savings in energy costs. Additionally, by offering excellent glare control, the fabric provides good interior thermal protection, while also optimising natural light and retaining excellent transparency and sharpness of view. The roller blinds are programmed with Horiso’s Climate Ready Control System that works by tracking sun position and measuring overshadowing components to control the blinds accordingly and maximise shading performance.